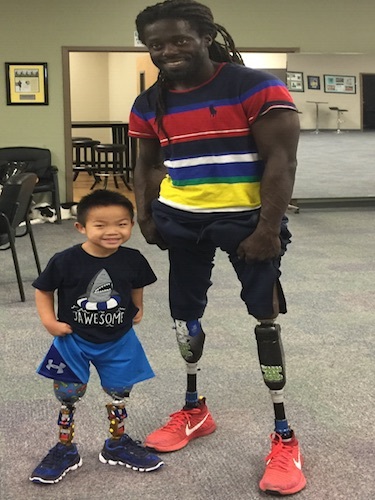 Four-year-old Charlie – recently adopted from China and missing both legs above the knee since birth – arrived at POA last month, eager to be fit with his very first set of prosthetic legs. While his check sockets were being fabricated, we introduced him to his new prosthetic “parts.” Charlie was fascinated with the feet and knees, and couldn’t wait to go to the store to pick out some shoes! “Mine,” he declared, as he held a small prosthetic foot to his cheek. We asked Bella and her family if she could stop by and give Charlie a few pointers. Bella, age 7, was also born in China missing her legs above the knee. Ever since we fit Bella with her first legs when she was 3 years old, she has been unstoppable – running, jumping, playing tag with her siblings – you name it! When she learned that Charlie was also a bilateral congenital amputee, Bella couldn’t wait to meet him! She had never met another child with the same level of amputations before. As Bella walked into the room, Charlie’s eyes got bigger. He motioned for her to sit down and looked at her legs, her feet, and her “little” hand. “Like me,” he exclaimed, and gave Bella a great big hug. The two quickly formed a close bond. Bella was there for Charlie’s first steps, helped him learn to get up on a chair, and from sitting on the floor to standing. “Bend and lock,” Bella instructed Charlie as he learned to walk in the parallel walks. “Bend Lock,” Charlie repeated. By the end of the day, Charlie was well on his way to walking independently. That was when he made another connection. Regas Woods, a paralympic athlete who was also born missing both legs above the knee, was across the room discussing some adjustments he wanted to make on his running legs. Regas was wearing long pants so Charlie didn’t know he was an amputee. We invited him over to meet Charlie and said “look, he has two feet and two knees like you!” Charlie excitedly pulled up Regas’ pant legs and hugged him tight. Then he asked if we could take their photo. Charlie was beaming from ear to ear as he posed with his super hero. For the first time in his life he met two people “just like him,” and you could see the incredible instant connection they had. What an amazing day at POA. We are so blessed to have so many wonderful and caring clients who truly make a difference in the lives of others. Charlie returned home to practice his walking, and his mom reports he is now beginning to walk independently. We have no doubt he’ll be back very soon to be fit with running legs, and Bella promises to be right there to show him how it’s done! Conner, One Week Later – Walking Unassisted! 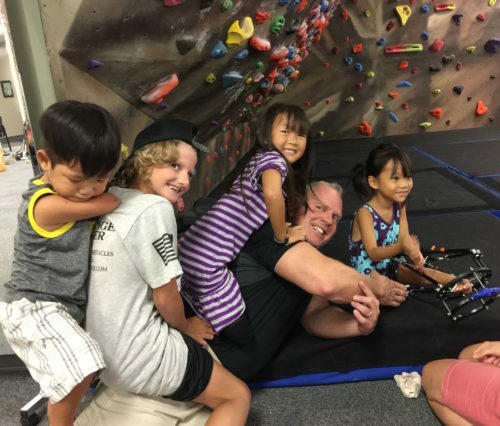 Conner, born with a condition that affected the development of his legs and hips (PFFD), had never been able to walk successfully on prosthetic legs. He stayed active by playing wheelchair tennis and used short prosthetic sockets attached directly to the feet (called “stubbies”) to get around. 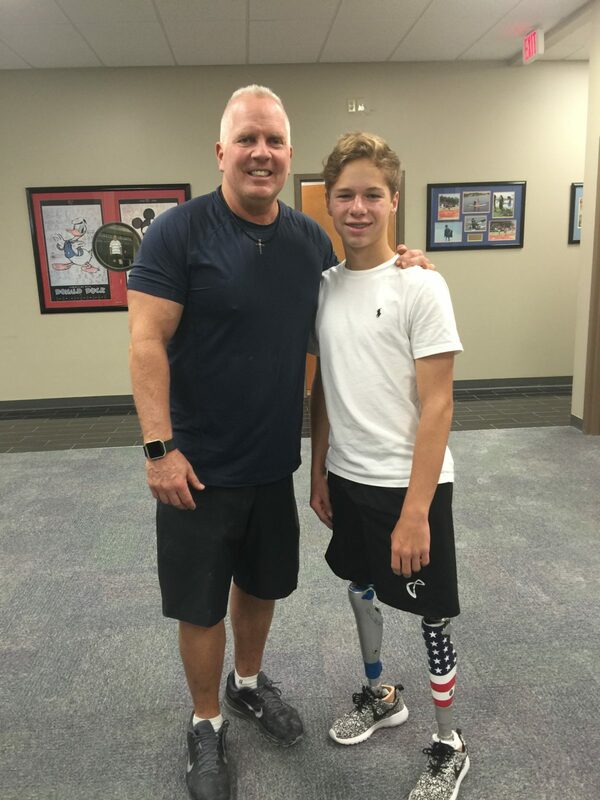 One of our POA clients, a physician who has played wheelchair tennis with Conner, told him about our experience and success with many PFFD amputees using new technology – and now he is one of them! 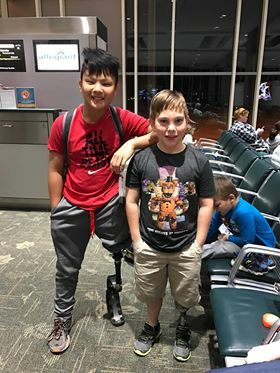 Exactly one week after taking his first steps ever on full prosthetic legs, Conner returned home walking tall! 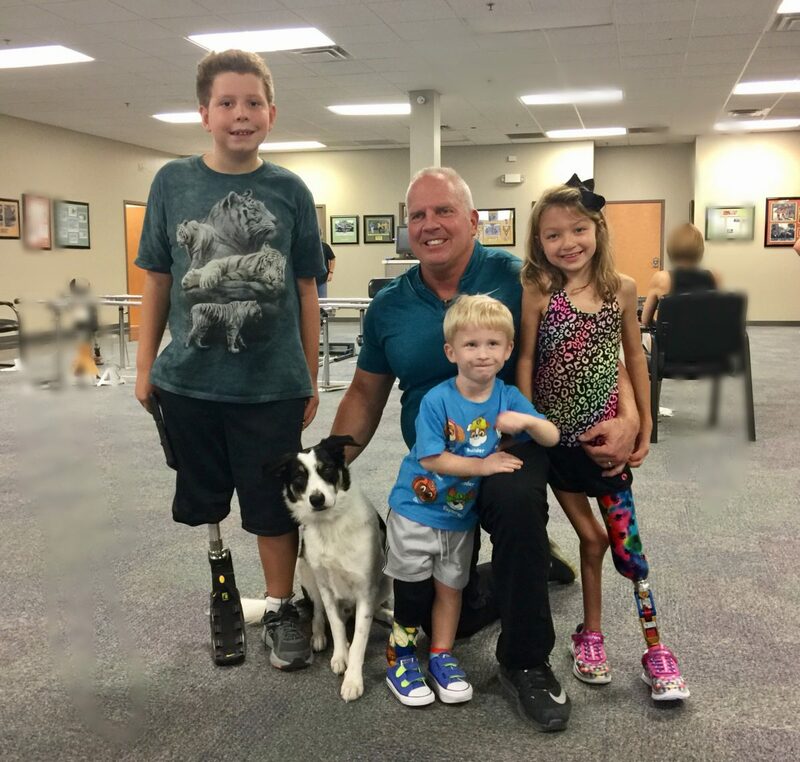 Author MMGPOAPosted on August 3, 2016 Categories NewsTags amputee, bilateral, double, Florida, foot, kids, knee, leg, Orlando, PFFD, POA, prosthetic, walkingLeave a comment on Conner, One Week Later – Walking Unassisted!